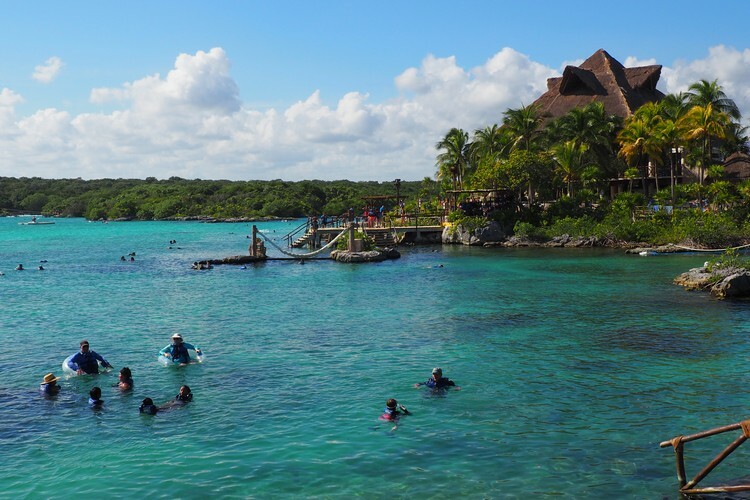 What activities are at Xel Ha Park? 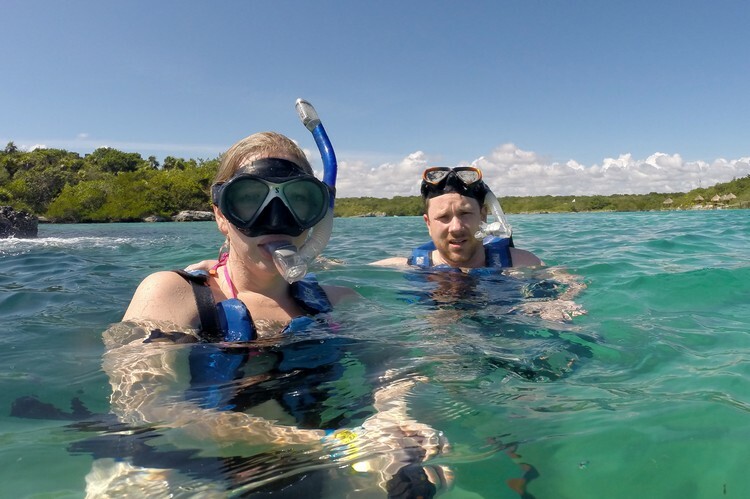 How is the Xel Ha Snorkeling? 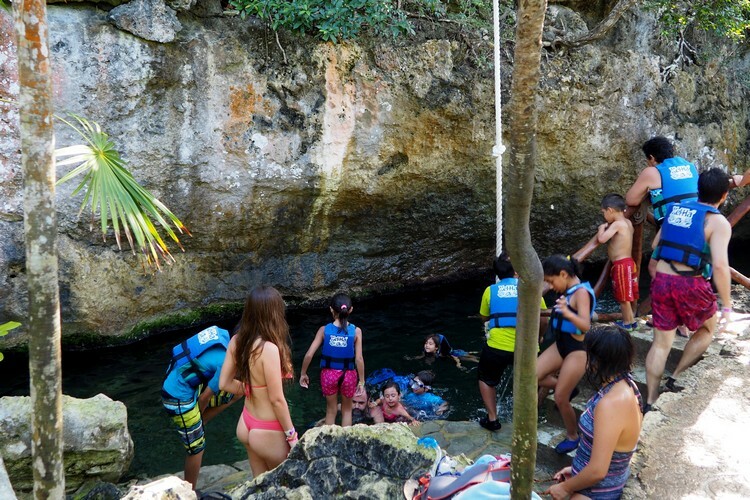 Safe for children to go Snorkeling at Xel-Ha Park? 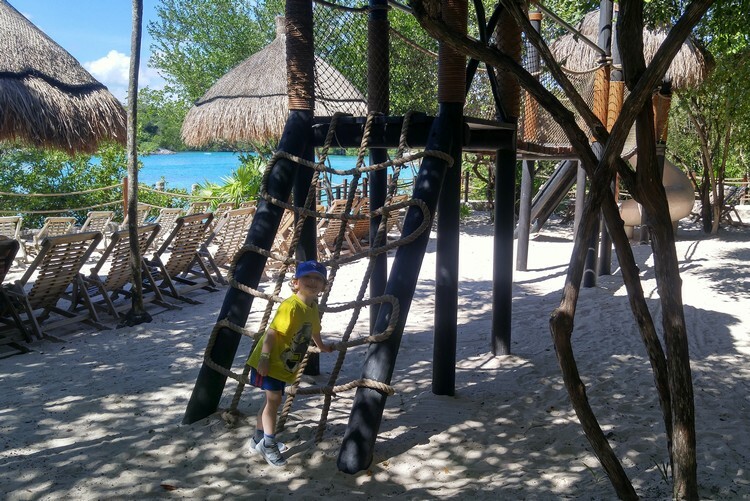 Are there age restrictions at Xel-Ha Park? How are the Restaurants at Xel-Ha Park? 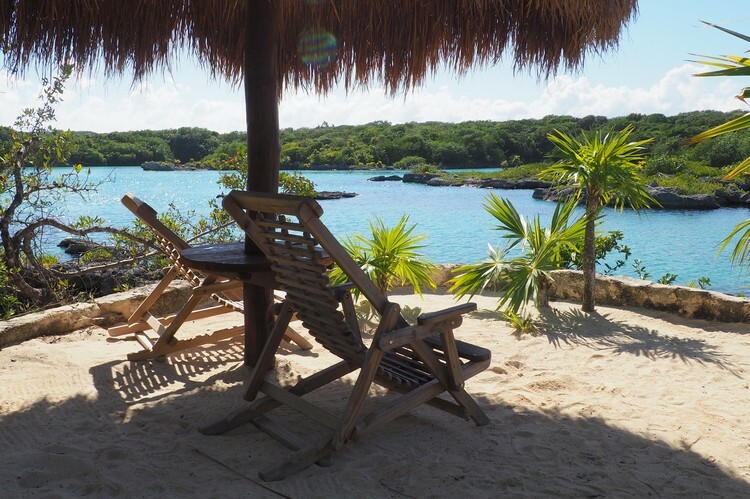 Do you need Special Sunblock at Xel-Ha Park? 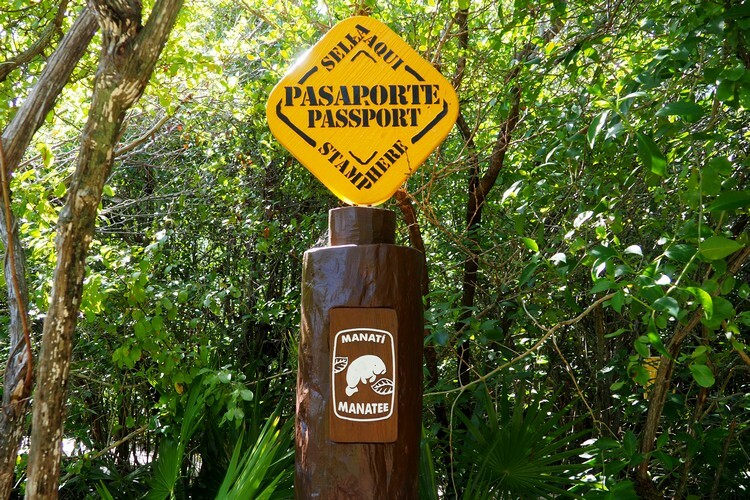 How do the Passport Stamps and Photos work? What is the Price of Admission to Xel-Ha Park? What is NOT included in the price of admission? 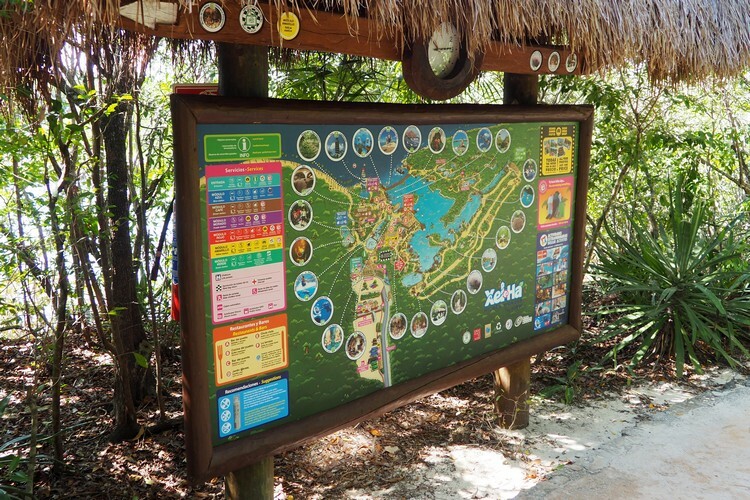 What are the Xel-Ha Park Hours of Operation? 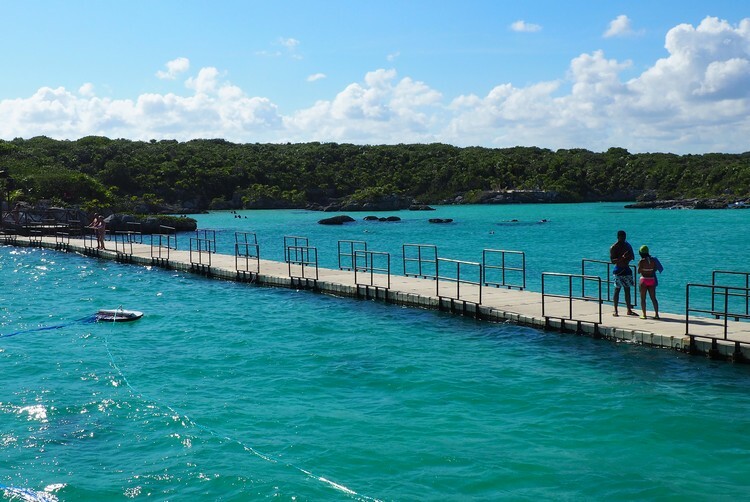 How do you get to Xel-Ha Park? 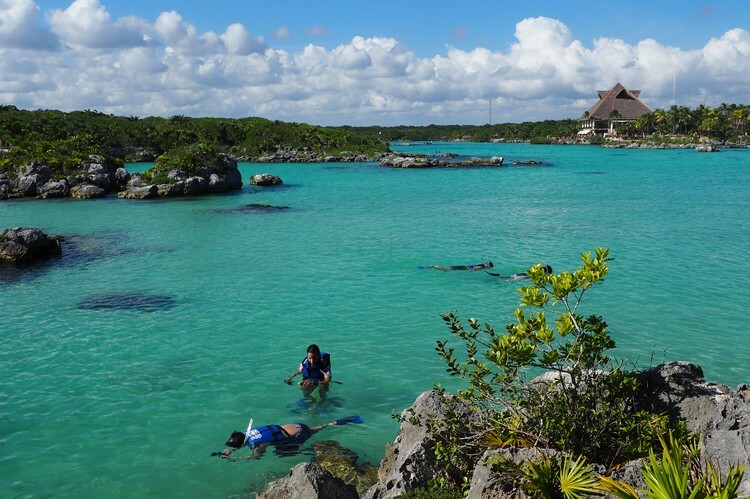 Is it worth it to visit Xel-Ha Park? 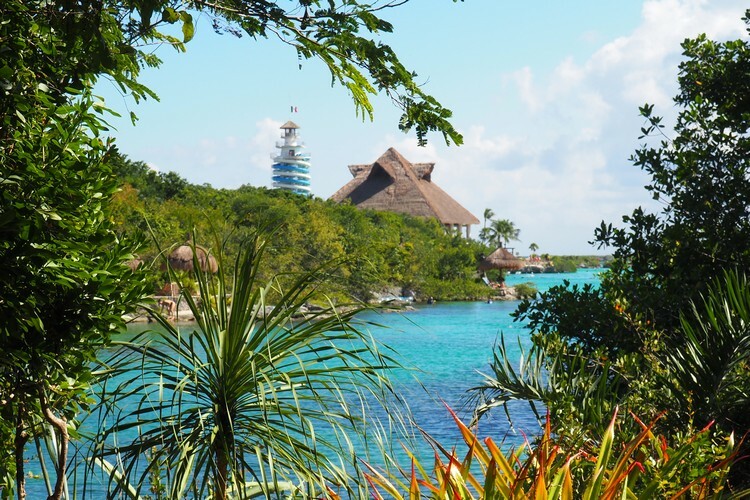 Have you visited Xel-Ha Park in Mexico? Xel-Há is an aquatic theme park where guests can snorkel, relax and enjoy the sparkling Caribbean waters in a safe, secluded inlet. 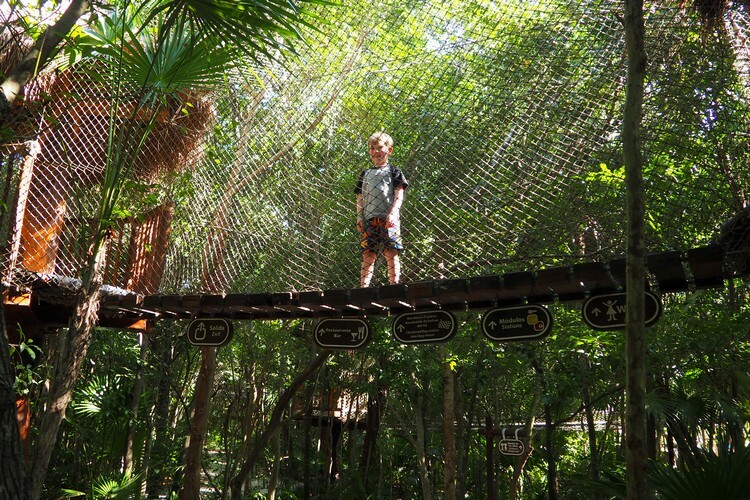 The adventure park is located just north of Tulum in Mexico’s Riviera Maya, about a 1.5 hour drive south of Cancun. 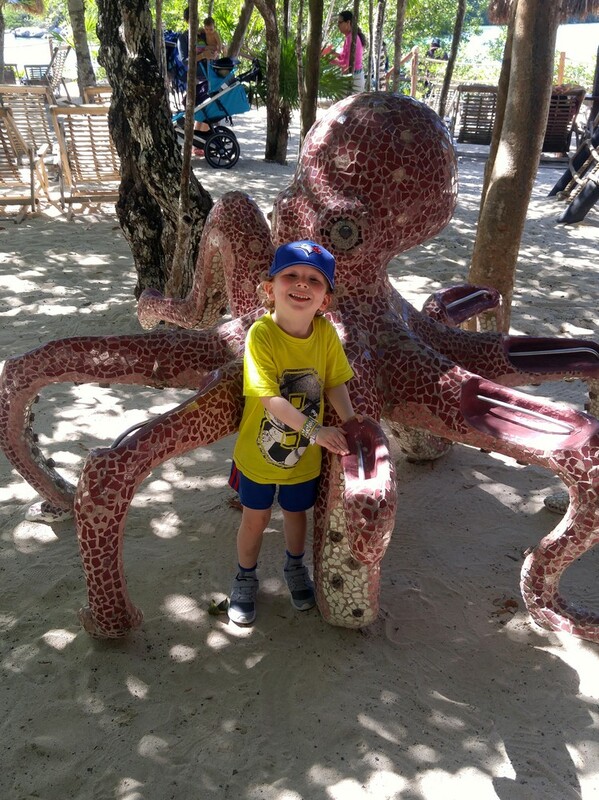 We have visited the Riviera Maya several times before, but this was the first time we visited the amusement parks. 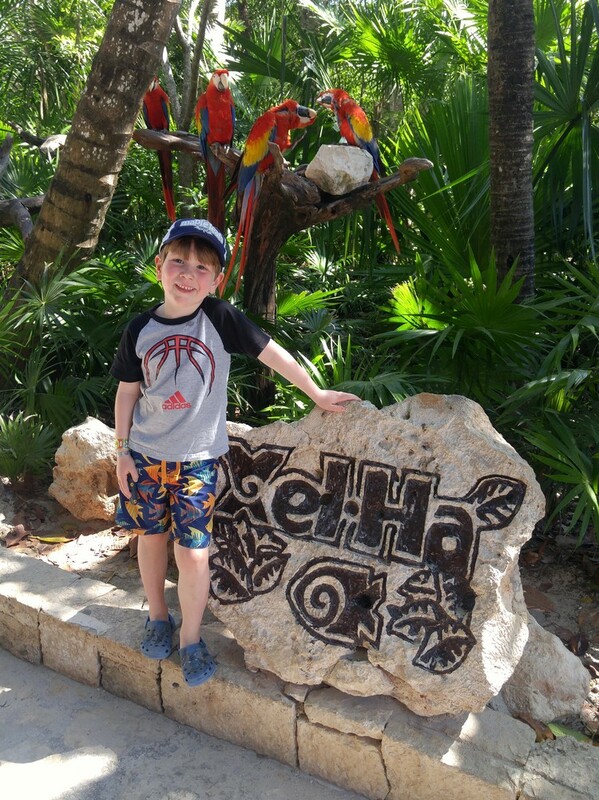 After researching each of the Riviera Maya theme parks, and reading the recommended ages (our youngest is 4 years old), we decided to visit Xel-Ha and Xcaret on this trip to Mexico. 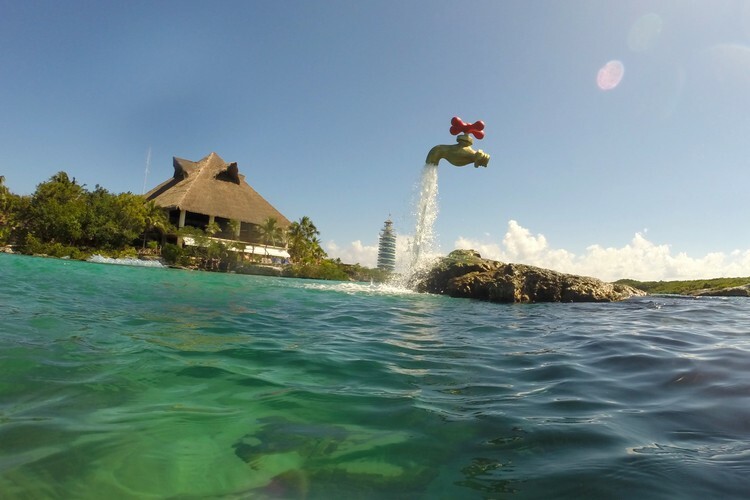 In this post, we share our experience at Xel-Ha Park. 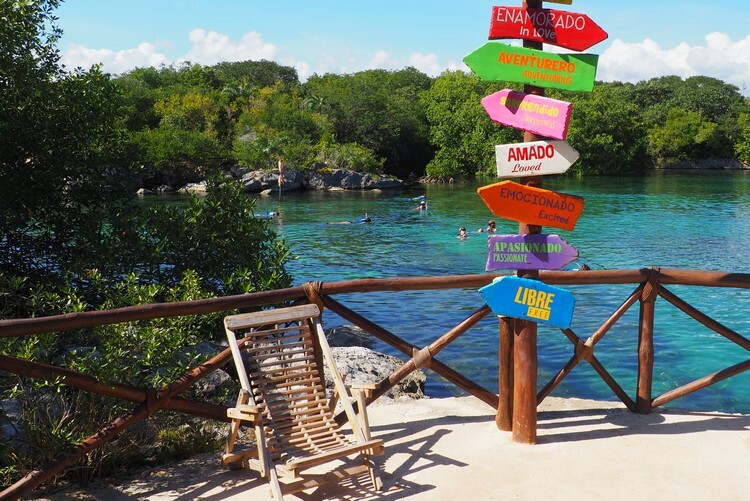 There are plenty of adventure parks in the Riviera Maya, so why would you want to visit Xel-Ha Park? The water inside the cove at Xel-Ha is calm, which made snorkeling easy for everyone, including our young boys and parents (grandparents). 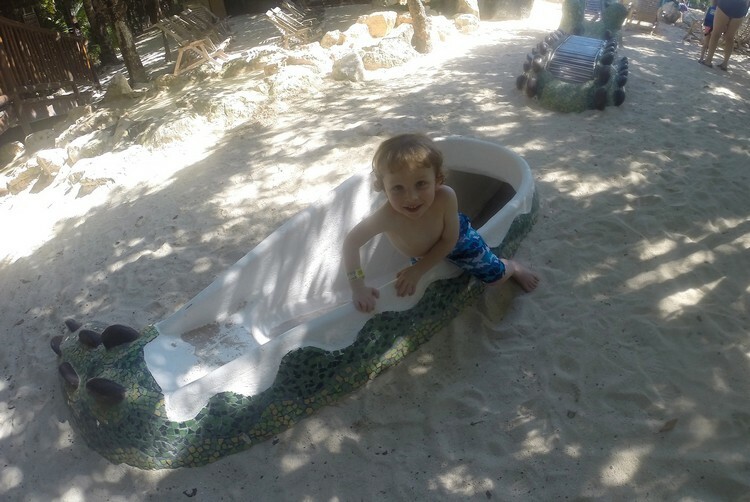 This is what makes Xel-Ha an attractive option for families. For those who are new to snorkeling, or nervous about swimming with fish in the ocean, this controlled environment is a nice introduction. The park has several entry points with stairs that lead into the water, so getting in and out of the water is safe and easy. All of the entry points have life jackets available in all sizes. 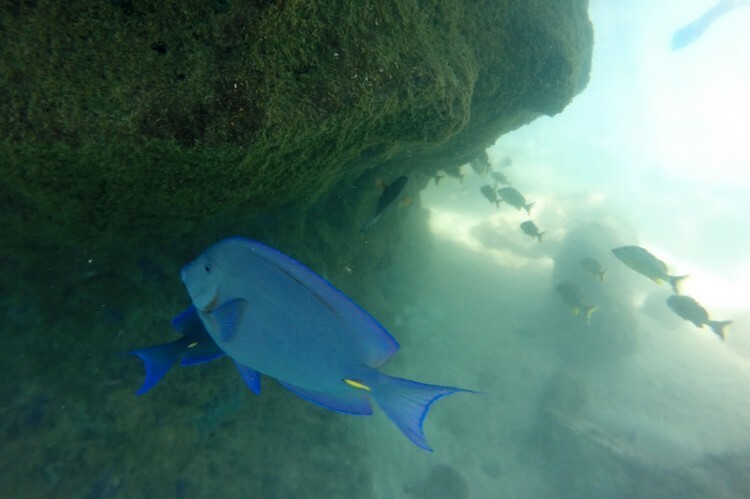 The Xel-Ha website states that the park has more than 90 marine species such as angelfish, surgeonfish, damselfish, snapper, parrotfish, grouper, sergeant major, a family of rays, pufferfish, some barracudas and the queen conch, a protected species that inhabits the cove. The waters inside the park create a unique phenomenon because the dense sea water mixes with the fresh water from the rivers. 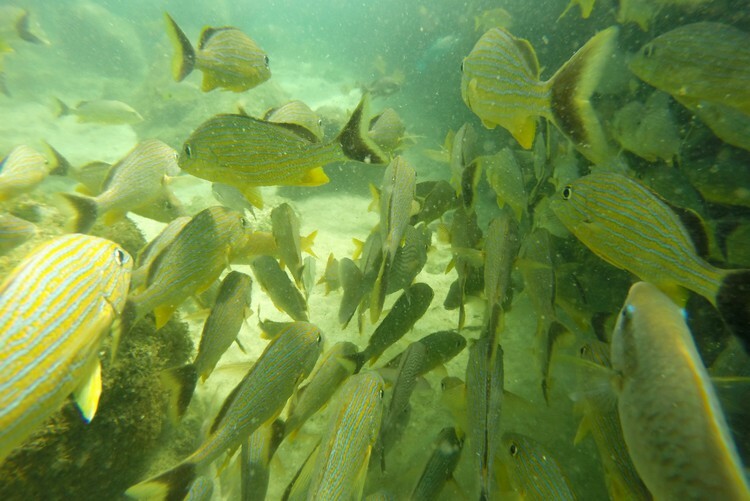 The water was fairly clear and we saw plenty of colorful fish (as the brochure promises). Most sections were not very deep – we estimate it was likely 15 to 20 feet deep. We were able to see the ocean floor. Snorkeling masks and fins are included. We brought our own snorkel gear, so we only needed to borrow fins. We used the complimentary life jackets but they limited our ability to swim deeper. To get the fish photos below, we had to take off the life jacket temporarily so that we could swim deeper and get up close. For the photos below, we used this underwater camera. We found a lot of fish hanging out underneath this fountain. Our kids LOVED the playground at Children’s World. We found a quiet spot right in front of the entry point to the water, which was an ideal location. We spent most of our day here. Our boys spent hours playing in the tree house and ropes course while we relaxed in the comfy chairs with our toes in the sand. Activities at Children’s World include a water slide, crocodile tunnel, wading pool, rope climb, seesaw, tree house, water lillies and interactive kids activities. If you have young kids, we suggest you make this area your home base for the day. There are plenty of chairs and the playground is shaded by trees, so you don’t need to worry about your kids getting to much sun exposure. There is also lots of hammocks available in the nearby hammock village. The tree house/ropes course is a loop, so there’s only one way in and out, making it easy to keep an eye on your kids. Braydon had fun leaping across this lillie pad course. Don’t miss a post! Get new posts delivered to your inbox. They must have done this tree fort circuit 20 times that afternoon. They loved it. This is the tail exit of the crocodile tunnel. It’s about 20 feet long. Yes, it is safe for young children to go snorkeling at Xel-Ha. All of the entry points into the water have life jackets available in all sizes. There are also plenty of inflated chairs and tubes to use. The water is warm and calm, so you don’t need to worry about big waves. It’s salt water, so your kids will float better than in a freshwater swimming pool. We did not see lifeguards, so swim at your own risk. It can get quite deep in some sections. 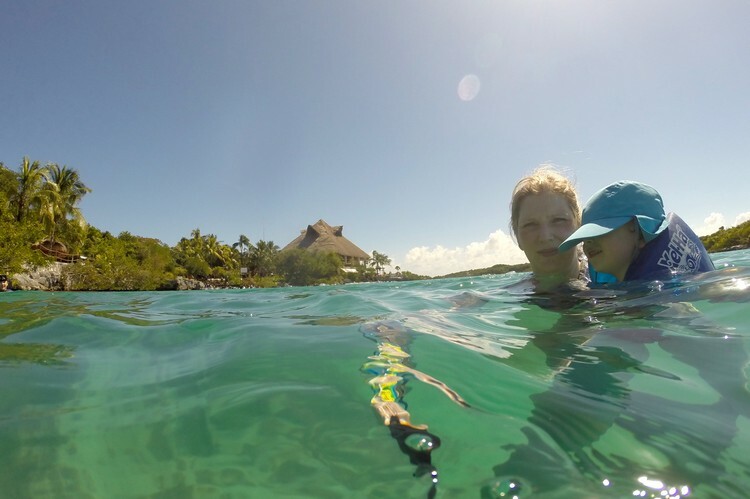 Above photo – Nicole and Connor swimming at Xel Ha Park. This is the lillie pad course. It’s located in front of Children’s World. 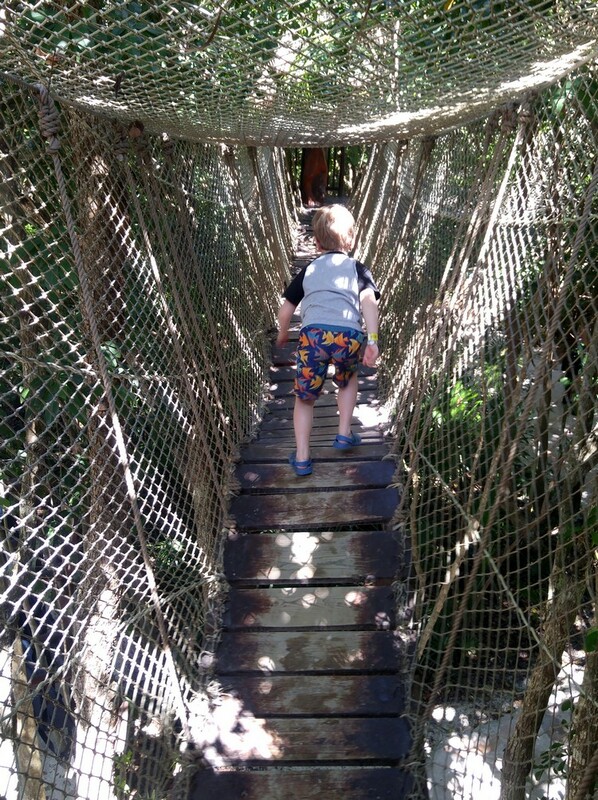 Xel-ha welcomes all ages. It’s stroller and wheelchair friendly, so it’s relatively easy to get around the park. Some of the activities have restrictions around pregnancy, epilepsy, heart problems, asthma, age, and hypertension, so you’ll want to do some further research before you visit. Before visiting, we were unsure if our 4 year old would enjoy the park. He does’t like to snorkel and most of the activities looked to be too big for him. He had plenty of activities to keep him busy. In fact, we probably could have returned for another day and he’d still have enough to do. The scenic lighthouse is a fairly new attraction at Xel-Ha. 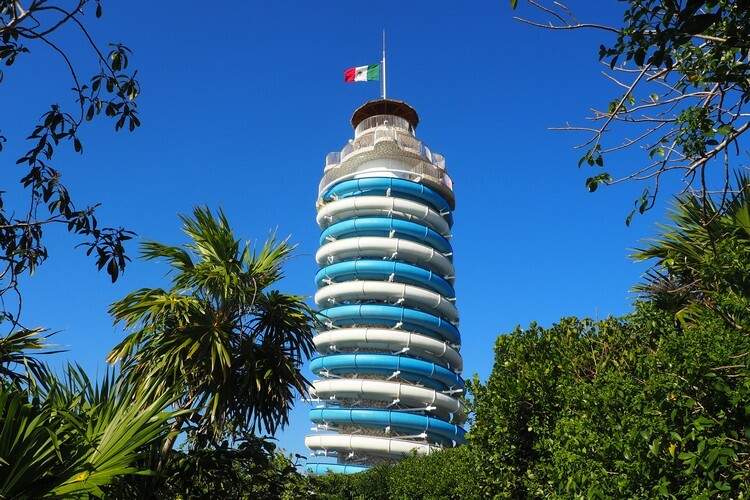 It offers 360° views at 131 feet (40 meters) high and an exhilarating spiral experience down to the bottom. There are four open waterslides to pick from, each with different speeds. You should know – the minimum height required is 3.5 ft (1.05 m) and maximum weight is 275 lbs (125 kg). For your own safety, it’s important to know how to swim. We did not attempt to do this water slide. Our oldest boy probably would have loved it, but his swimming is not strong enough for us to feel comfortable. It’s also quite high, and Cameron does not like dizzying heights, so we decided to take a pass. 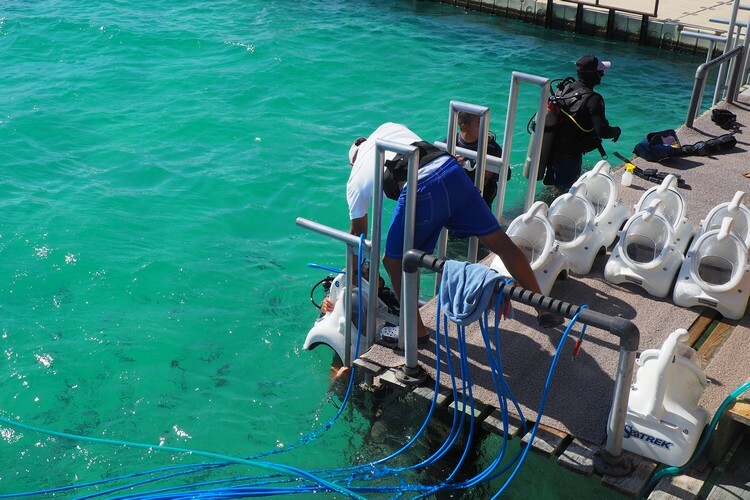 For an additional cost, guests can learn how to Snuba. You have the option to snuba in the underwater world in the cove or in a cenote. Learn about pricing and details here. 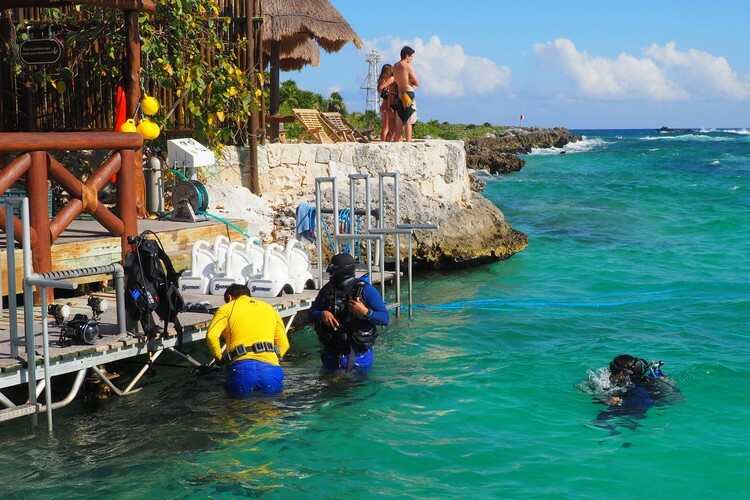 According to the Xel-Ha website: Xel-Há is the only place in the Riviera Maya and Cancun where you can go diving in a cenote without a certification thanks to the comfort and security of Snuba. It’s a cross between snorkeling and scuba diving. An oxygen tank floats on the surface allowing you to breathe comfortably while you explore the depths of the cenote or ocean. You must know how to swim and be at least 8 years old to Snuba at Xel-Ha. 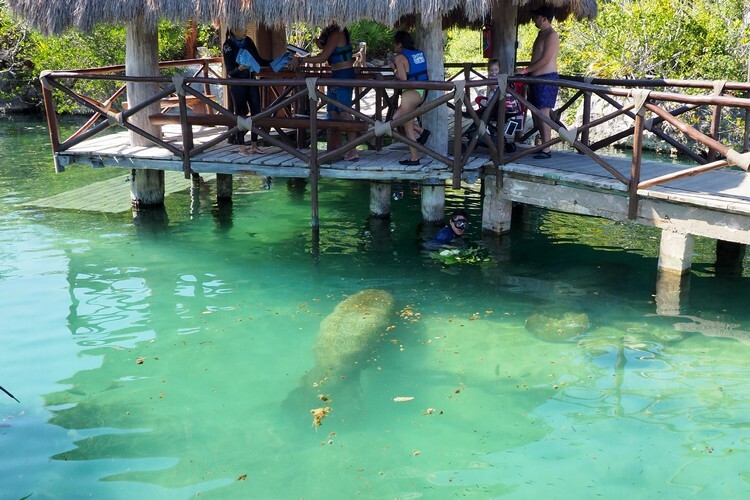 The Manatee Encounter at Xel-Ha Park allows guests the opportunity to swim with manatees. These gentle giants are often called sea cows because they are large and generally move slowly, however they can swim quickly and gracefully. This is an educational activity where guests will learn about the importance of manatees and how the deterioration of their habitat is endangering their future. Xel-Há maintains a permanent rescue and conservation program for manatees. 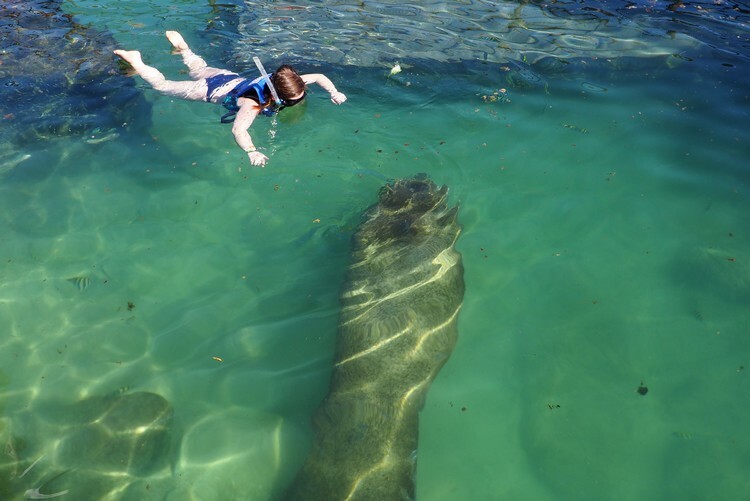 The minimum age to swim with manatees is between 5 to 10 years old. You must know how to swim. Children must be accompanied by an adult during the activity, both are required to pay. More details and pricing can be found here. 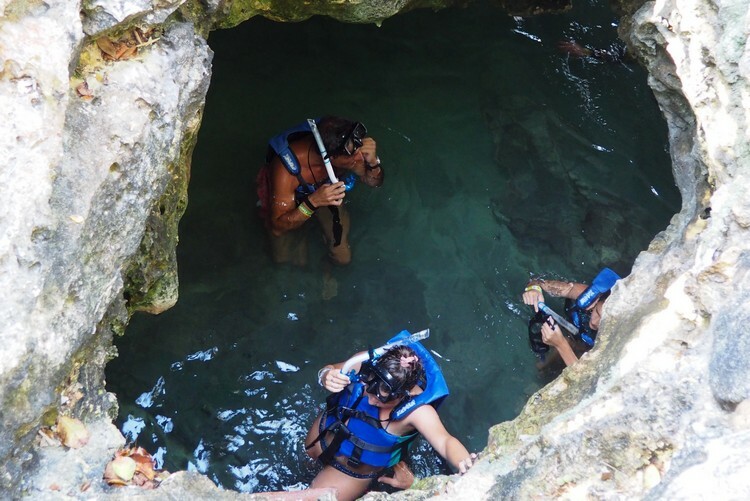 There are a few underwater caves at Xel-Ha that you can swim and snorkel through. If you’ve never swam in underwater cave before, this is a fun place to give it try. The Xel-Há website describes the Mayan Cave as a sacred place, where water transmits energy through its lighting and natural acoustics, leading to a state of peace and relaxation where small waves echo within this interesting enclosure of Xel-Há. 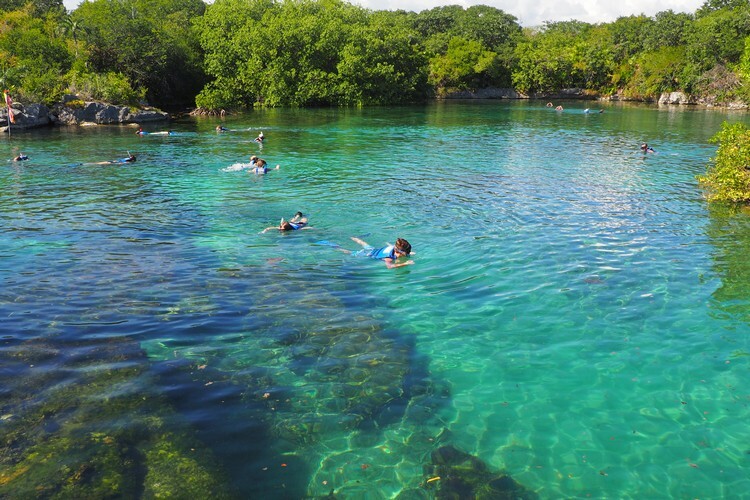 Swimming is not allowed in the two cenotes at Xel-Há because they are protected areas. Xel-Ha is an all-inclusive park. This means that food and drinks (both alcoholic and non-alcoholic drinks) at the restaurants are included in your ticket price. There are four restaurants inside Xel-Ha Park. The restaurants are buffet style and offer local and international cuisine, along with salad bars and dessert bars. They are kid friendly and high chairs are available. The main restaurant is located in that large pyramid building in the above photo. We also brought snacks with us because of Connor’s dairy allergy. Bringing outside food into the park is allowed. You can also purchase additional snacks and drinks from stores located throughout the park and near the entrance/exit. The food at Xel-Ha was actually pretty good. When we arrived we had the breakfast buffet, which included standard items like eggs, bacon, sausage, pancakes, potatoes, fresh fruit, variety of cheese and meats, etc. We also at lunch at the outdoor buffet near Children’s World. It had a wide variety of options ranging from tacos to burgers to pasta and everything in between. 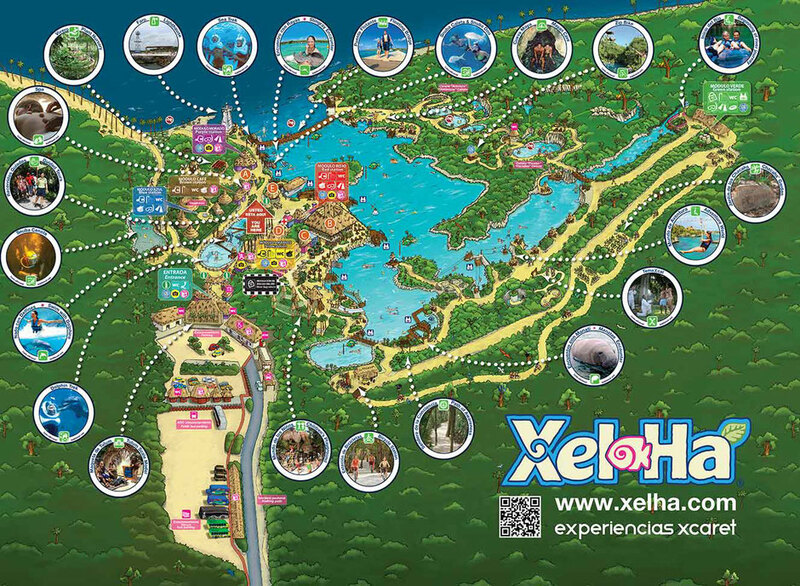 Above is a photo of the Xel Ha map. When we shared on our Facebook page that we we would be visiting Xel-Ha Park, a few people informed us that we would need to bring special sunblock. This was news to us, so we thank you for the tip! 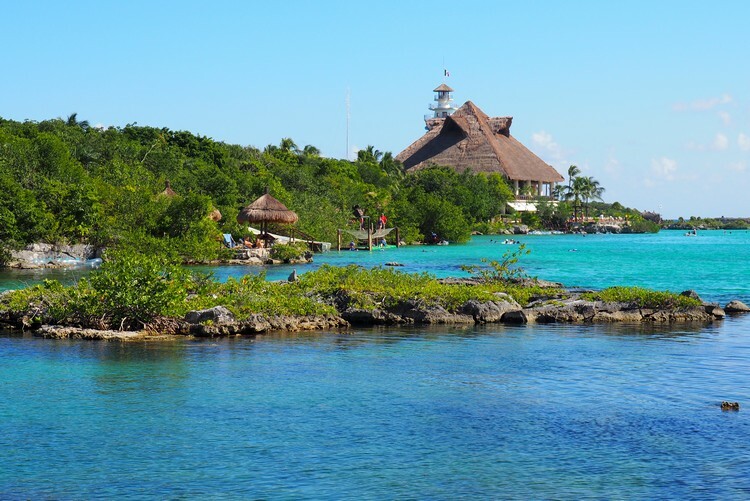 Xel-Ha Park asks that guest only use biodegradable sunscreen because normal sunscreens contain oils that pollute the water and cause illnesses to the marine life. The park strives to protect the environment and they ask visitors to do the same. Upon entering into the park, each person is given a wrist band (see photo below). This wrist band has a few features. First, it gives you get access to towels and snorkeling gear, which is included with your all inclusive package. Second, it acts as your deposit if you don’t return the equipment. It can also be used to capture photos at various locations throughout the park. 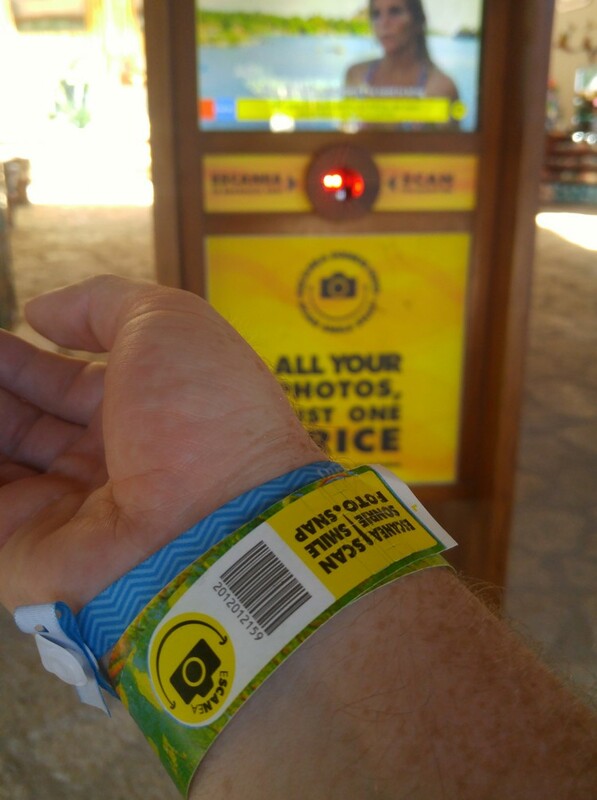 When you arrive at one of the photo locations, you scan your wrist band at the station and wait for the camera to take your photo. At the end of the day, you can purchase one or all of the pictures from the day. This is a great feature for guests who want to get in the water and do not have a waterproof camera or protective pouch. It’s also fun for kids to get stamps and photos at all of the locations, kind of like a scavenger hunt. If you don’t have a waterproof case for your phone, you should get one. It will protect your phone and personal items (like credit card and identification) from water damage and sand. You can order one on Amazon for less than $10. 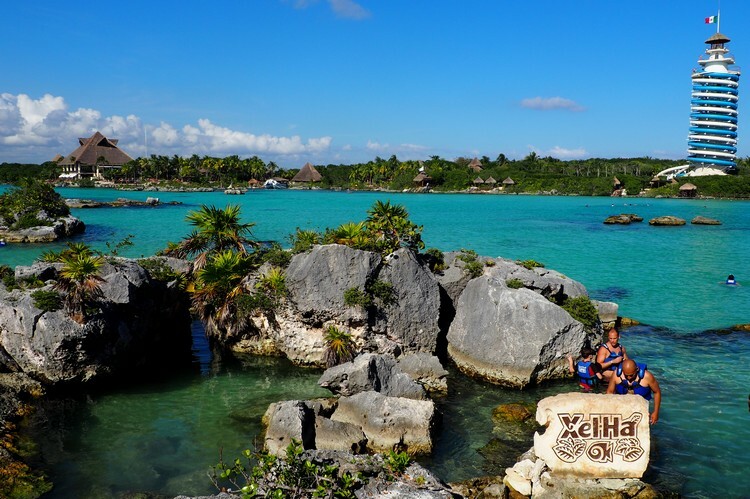 Travel tip – search for Xel Ha coupon codes before you purchase tickets. 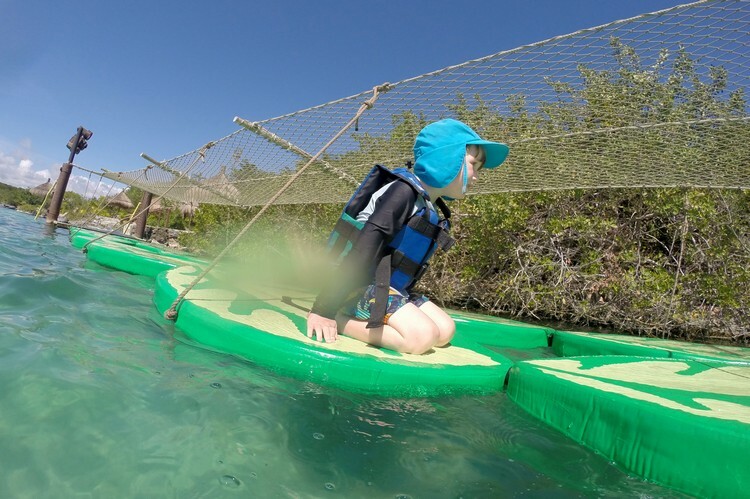 The standard price for tickets to Xel-Ha Park is approximately $105 CAD (Adult), $52 CAD (Child ages 5-11), and $0 for kids 4 and under (without transportation). This is the online price. If you want transportation included, the price is approximately $156 CAD (Adult), $78 CAD (Child ages 5-11), and $0 for kids 4 and under. However, there are a few ways to save on ticket prices. The best way to purchase Xel-Ha tickets is online. And, if you wish to visit more than one park, they offer package deals. Many hotels and resorts in the Riviera Maya can organize your trip for you. Are towels and snorkeling equipment included in the price? Yes, towels and snorkel equipment (mask, fins and snorkel) are included in the ticket price. You scan your wrist band at the towel/equipment booth and it acts as a deposit (you will need to add your credit card to the account attached to your wrist band). Are there lockers to store your belongings? Yes, Xel-Ha has seven bathroom facilities located throughout the park. Five of the bathroom facilities also have lockers where visitors can store their belongings. Lockers are included with the ticket price. Are there showers and change rooms inside Xel-Ha Park? Yes, there are six facilities that offer showers and change rooms. Almost everything is included in the price of admission including many of the activities, food, drinks (including alcohol), and parking (if you are driving a vehicle). The only things not included are adventure activities like Snuba and Manatee Encounter. You will need to bring biodegradable sunscreen with you. 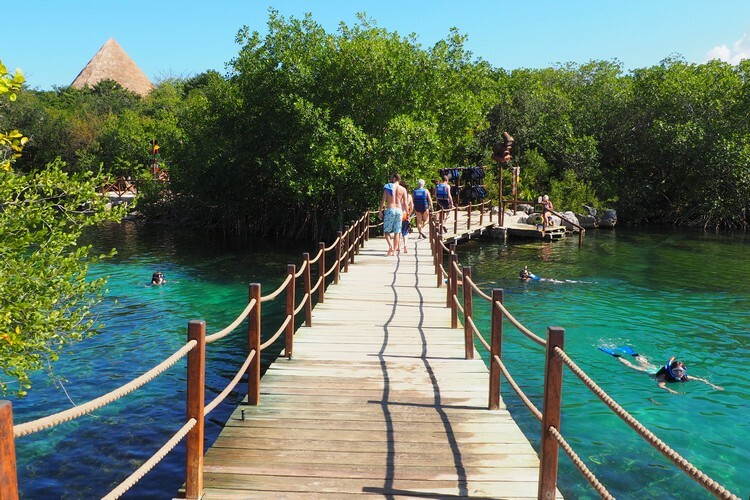 Xel-Ha Park is open 365 days a year, from 9:00 AM to 6:00 PM. It’s a big park, so we suggest you arrive early and plan for a full day of activities. In fact, the biggest mistake we made was leaving our hotel at 10:00 AM. The drive from our hotel was about an hour and the line-up to get into the park took 45 minutes. Even if you think you’ll only need 5 hours inside the park, we recommend you get an early start to the day (depending on where your hotel is located). Xel-Há is located in the State of Quintana Roo in Mexico. Xel-Ha is 110 kilometers south of Cancun, 10 kilometers north of the Tulum archaeological site and 40 kilometers from the archaeological site Cobá. If you purchase a package, transportation is often included. Or, you can get a private transfer (that’s what we did). The private transfer will pick you up at your hotel and drive you directly to the park entrance. It will also bring you back to your hotel at a time of your choosing. 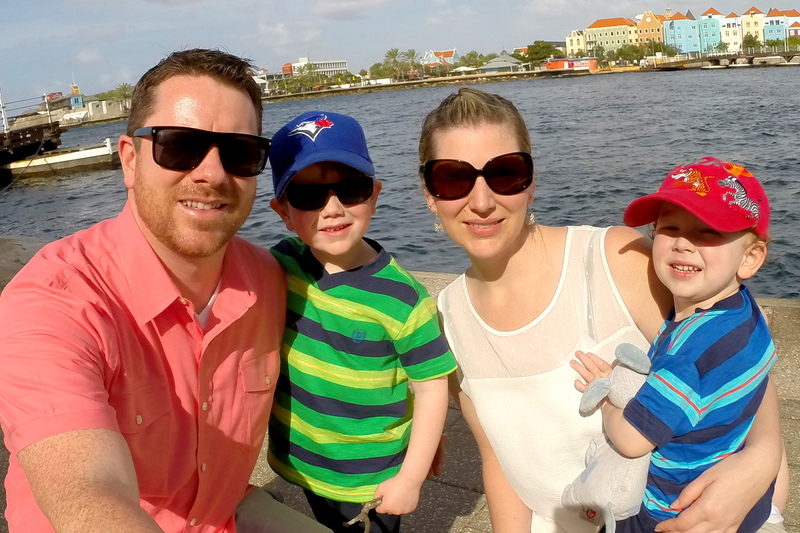 We used Cheap Transfer Cancun and they were great. We used them multiple times on our vacation to the Rivera Maya. The vans were new and they offered the proper car seat for our 4 year old. We would recommend using them. Prices vary depending on distance and number of people. More info here. We stayed at the Iberostar Del Mar and the trip to XelHa park was about an hour. We paid $100 USD each way for a private transfer for 6 people (including car seat). 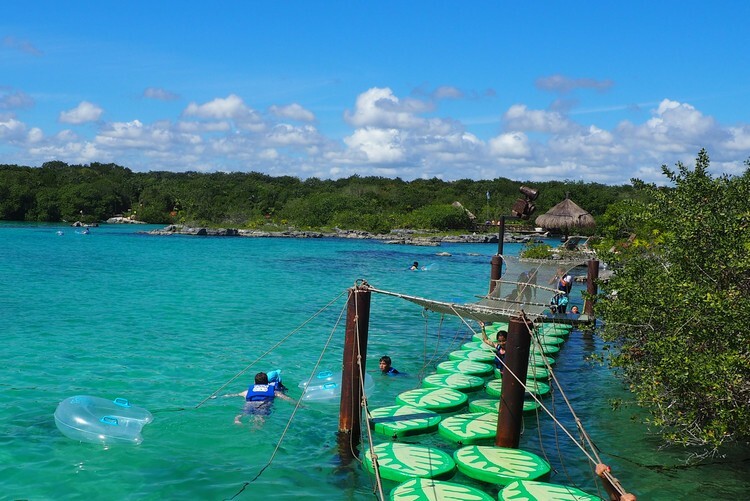 In our opinion, we think Xel-Ha Park is a great place to spend the day with your family. It’s a nice break from the resort and it’s easy. It’s not cheap, but everything is included so you don’t have to think. We suggest you purchase tickets online to save money. Make sure you arrive early so you have a full day inside the park. There are lots of activities, so you’ll want enough time to see and do as much as you can. Share your experience and tips in the comments below. Our readers thank you! So amazing park for kids and family, The most exciting thing for me was that the wrist band giving opportunity of taking pictures and access to towels etc. Thanks for your comment. Totally agree. We had a really fun day and our 6 year old loved taking pictures with his wrist band. Hi, Well, this is my first visit to your blog! It is very very interesting to know about the Xel-Ha Park We are a group of volunteers and starting a new experience in the same niche. Your blog provided us valuable information to create the interest on visit the park. You have done a marvelous job! OMG… wha a amazing. I heard about Xel-Ha Park before couple of weeks but I didn’t pay my attention toward Xel-Ha Park but when I i visite on this post. I came to know this really amazing park for family. 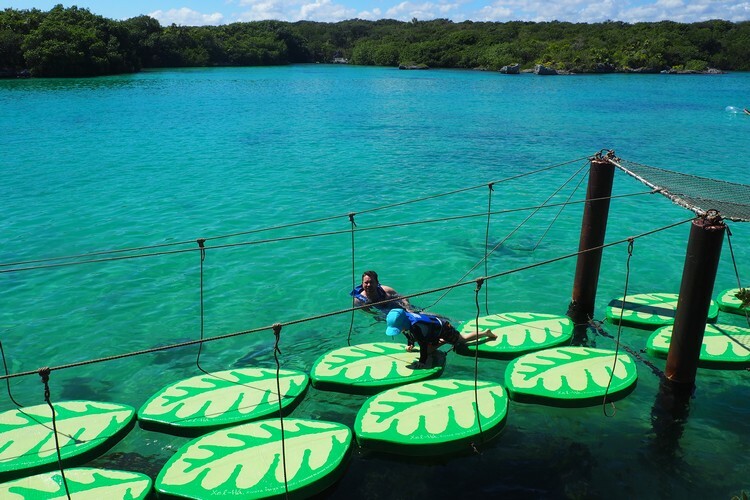 There are such amazing thing to enjoy at Xel-Ha Park. I wish to visit there very soon. Xel-Ha Park looks like an amazing place! Beautiful shots. So glad I came across this blog. We are headed to Riviera Maya in August 2019, we have 10 days at Occidental resort. we would love any tips or suggestions.